A classic cookie – everyone loves these! And oh my gosh are these yummy! Whisk flour, starch, xanthan gum, baking powder, and salt in a medium sized bowl. Mix together yolks, milk sub, and vanilla in a measuring cup (or something else with an easy-pouring lip). In a stand mixer, cream sugar, margarine, and shortening until light and fluffy. Beat in the yolk mixture until just combined. Slowly add the dry ingredients until the mixture starts to clump together. Prepare baking sheets with silpat, parchment paper, or Reynolds Release. 1 – thwap it onto a sheet of waxed paper and roll it into a snake. Refrigerate for at least an hour. Slice cookies about 1/4? thick, lay out on prepared cookie sheets about an inch apart. 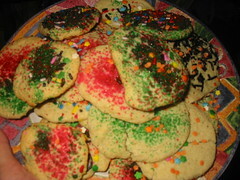 Decorate as “ornaments”, and bake at 350 for 12-14 min, until golden brown on the edges. 2 – Roll out dough (work with about 1/4 at a time) to 1/4-1/8 thickness. Flour cookie cutters with whatever cheap gf flour/starch you have on hand. Use cookie cutters to cut out shapes. Transfer cut-outs to prepared baking sheets, and leave 1? of grow room around. Decorate as desired, and bake at 350 for 12-14 min, until golden brown on the edges. Let cool on baking sheet for a few minutes, then transfer to a wire rack and cool to room temperature if you can wait that long to eat them.